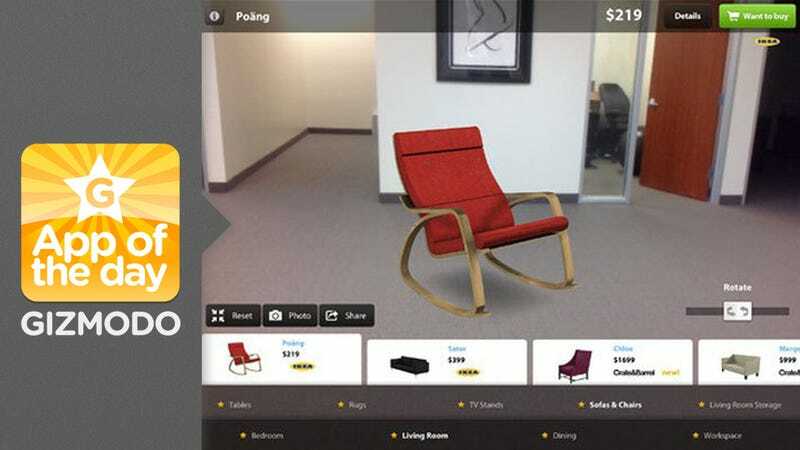 Known once upon a time as IKEA Now, the now-revamped virtual remodeling app changed its name after running into a bit of legal trouble. But they're back and better than ever, bringing Android support and the addition of more than just IKEA furniture. So you can refurnish every room in your home as often as you want without spending a dime. Lets you see what will actually look good in the rooms of your home before you make the purchase. You can take photos of rooms in your home and browse several major retailers' catalogs, dropping the furniture you like into your very own home. Mix and match different pieces, and if you really like the way something looks, the app even directs to the retailer's site, where you can officially make it all your own. Other than IKEA, Furnish now offers Crate & Barrel and Pottery Barn pieces. But if those alone don't get you excited, they'll "soon" have furniture from Restoration Hardware, Living Spaces, Sears, Ashleys, Plummers, Bassett, DWR, Target, and CB2. So there will be something for practically anyone. And even if you're not planning on redecorating, it's just plain fun to map out new layouts The Sims-style—but for your very own home.